This is a farmstead that is located at the extreme southern end of Fairbury’s First Street. Going south from the stop light on Route 24 and First Street will bring you to this picturesque group of farm buildings on the west side of the road just before you get to the “T” intersection. Nestled in next to an endless view (literally) of corn and soybean acreage this arrangement of old time farming prowess delivers an experience that “city folk” just don’t often get the chance to enjoy. The Kilgus family maintains an assortment of farm animals which are indigenous to Illinois farm life and are expertly cared for utilizing the vast experience that these folks have in this venue. This in turn provides a diversified arrangement of products from beef, pork and goat meat to milk and ice cream all of which come from the personal stock of the farm. Fronting this vestige of open air efficiency is the Kilgus Farmstead Country Store which carries a variety of local products including jams, jellies, honey, yeast rolls, butter, cheeses, popcorn and eggs in addition to the meat products described above. There is also a viewing window inside the store that allows visitors to look into the milk bottling plant and at least three days a week they would be able to see the bottling operation in full swing. One of the highlights of coming into the Country Store is the soft serve ice cream, freshly made, from that very milk that you can see being processed through the viewing window. Along with vanilla, they have special seasonal flavors through the year. Kilgus provides premium products for local customers and even popular restaurants in Chicago because of the quality and organic taste. They promise to never give any growth hormones of any kind to their animals, and very rarely use antibiotics. 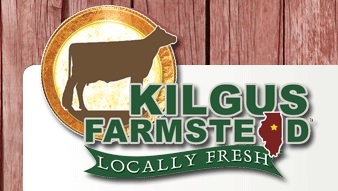 Kilgus milk tastes different because it comes from pasteurized cows and is non-homogenized. This process creates a vitamin-packed milk that tastes rich and delicious. The farmstead gains attention not only from the community, but from the state of Illinois. They have countless restaurants and retailers that use their fresh, natural products, most notably in the Chicagoland area. So if you want meat, milk, or other products that some think they could only find in a fancy Chicago restaurant, just stop by at their convenient Fairbury location.